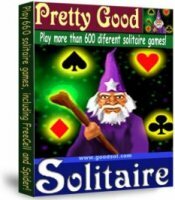 Goodsol Development has just released version 3.0 of Pretty Good Solitaire for Mac OS X. This flagship Mac solitaire collection includes an astonishing 550 different solitaire card games, from classics such as Klondike, FreeCell, and Spider, to fresh original games available nowhere else. This is the third major release of the package, which includes 50 new games, a redesigned main screen interface, and retina-optimized graphics. It requires OS X 10.6 or later. Pretty Good Solitaire's built-in intelligence lets you spend more time planning strategy and having fun, and less time making tedious, routine moves. When you click a card, the program automatically examines all possible legal moves, and makes the most likely choice for you. For those occasional errors that we all make, Pretty Good Solitaire has unlimited undo and redo functions, allowing you to go back to the beginning of the game and re-think your strategy. Dynamic Card Sizing - the game selects the best card size to fit your screen, or you can select from one of the 5 card sizes. Pretty Good Solitaire is the solitaire game for players who take solitaire seriously!